Ensuring that new construction homes are properly air sealed often means communicating with all trades so that they understand their respective roles in achieving airtightness targets. How you communicate the requirements may differ, but there are some commonalities that top builders have when it comes to assuring air sealing success. Whether constructing a code-built home under the 2012/15 IECC or a high-performance home like Energy Star or Zero Energy Ready, many builders conduct mandatory contractor training to ensure delivery of energy-efficient, airtight homes. Some, including Providence Homes, which we profiled in 2016, work with a building science consultant to train their trades, while others handle the job in-house. Notable, in either case, is that they don’t assume that each trade knows what the other is responsible for when it comes to air sealing. Getting them all together at one place and time ensures that they all get the same message and understand that a team approach is required to deliver a quality product. Everyone’s heard the adage “if you drill it, you fill it,” but spelling that out within the scope of work and directly to the contractors involved in construction is critical, with so many different parts of the building to be sealed by numerous contractors. Detailing who is responsible for filling holes can help builders avoid contractor disputes, delays, and cost overruns. Equally important is assigning a quality assurance point person such as superintendent to look over everyone’s work. Quality assurance can be a very effective strategy to verify that contractors are air sealing the holes they create as required by the contractor or scope of work. 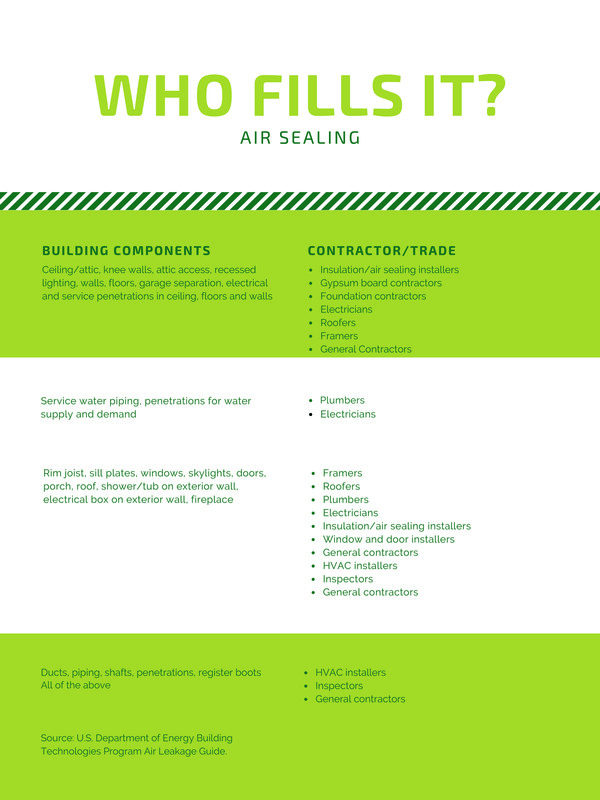 The U.S. Department of Energy (DOE) Building Technologies Program Air Leakage Guide provides useful insights about which contractors might be responsible for air sealing holes within home construction (see chart below).